Woo! The middle of the week is upon us. If you're like me, you're just happy to be inside a nice, warm house. I had to duck outside to put a bag of freecycle items out onto the front porch and let me tell you, it is certainly a winter wonderland in my neighborhood. I may actually have to go out and sweep the snow off of the front porch before Peter brings the boys tomorrow. He's also going to borrow some of my boxes (and heavens knows I have enough of them, huh?) for their upcoming move. I think I mentioned that the sale of the house fell through, so Peter, Donna and the boys are going to be moving back into it. It's a great house and I hope that the people who were living there didn't mess it up too much. The boys said they did but I have faith that Peter can get it looking good again. So, did anyone go check out this weeks theme or did y'all just wait for me to tell you what it is? 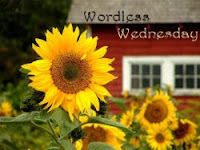 Well, over at Sunday Shutterbugs, the theme is Curves. Now, it was suggested that I could put a photo of myself up here, but that's just not going to happen. Instead, I'm posting a couple of pictures that I actually took the other day! I sneakily took this photo at the IGA the other day. Shhh...dont tell, ok? 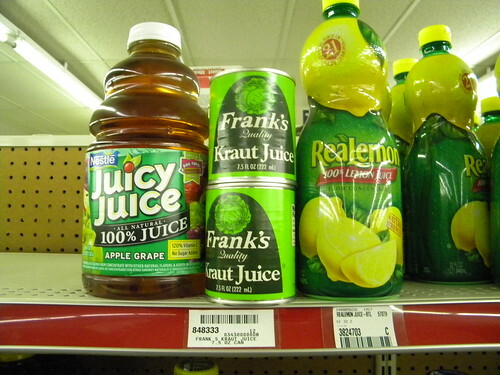 As you can see, they carry a "wide variety" of juices, including Kraut juice. Quality Kraut Juice, at that. It's right next to the questionably colored Apple Grape juice. This folks is part of the reason I avoid that store. Their stock is rather questionable. Now, onto my challenge for you. I've decided to stick with the kitchen for today's challenge. Since someone has been leaving such subtle comments about his pyrex collection, here's the challenge. I want you to go to wherever you keep your plastic storage bowls. I know y'all have them because I have them and everyone else I know has them. I want you to sort through them. Do you have stained ones that you won't put food in because well, it just looks gross? Do all of your bowls have lids? Do all of your lids have bowls? Sort through them and hold onto what you'll realistically use and set the others free! Let me know how you did. I'm loving the comments! 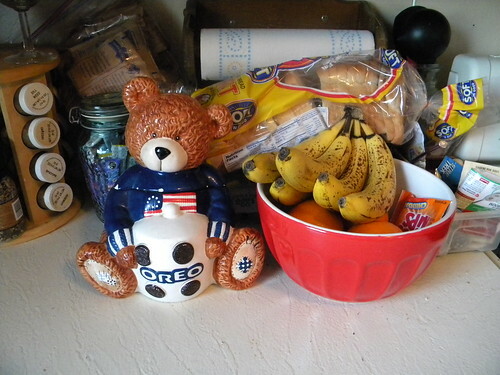 I love your cookie jar, that is so cute! I haven't shopped at IGA in years! Love the cookie bear ... would love a cookie even more! OK, I got all three things done today that needed to be done! I did the tupperware cabinet and the pan cabinet. I also got the vacuuming done (another huge yuck factor when I emptied the vacuum). All of this after being at work an extra couple hours. Thankfully, I didn't need to move any more snow, so I am ready to relax! Mmmmm, banana bread? I want some. I've had a taste for that for about a week, but too lazy to make some. okay, I am so grossed out by the thought of KRAUT juice! Ewww. But thanks for playing along with us again this week!